Shut down the Human Rights Commission by ignoring it. I wrote a piece on the above cartoon by Bill Leak when it was published a few months ago. 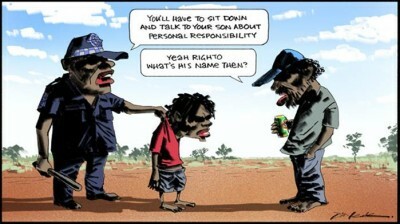 Since then we have had the extraordinary situation of the Australian Human Rights Commission, (HRC), publicly canvassing for people who might have been offended by the cartoon so they could prosecute the cartoonist and the publisher under the deeply flawed law 18c which makes it illegal to offend or humiliate anyone based on their race. A good summation of what has been written about this over the past few days can be found over at Catallaxy Files. The prosecution is going ahead and the publisher of the cartoon, The Australian newspaper, is preparing to defend itself and its staff. But it is here that I disagree with the forces who are trying to protect free speech as I do not believe the publisher nor the cartoonist should defend themselves at all. For any economy to grow there first needs to be certainty, and the confidence that a trader can buy and sell without having his goods or assets seized without recourse to law. Likewise with political freedom. You can’t be free unless you know with great certainty what is legal and what isn’t. Otherwise, when what is permitted is arbitrary, then something that is commonplace today will merit a prison sentence tomorrow and death the day after. I have no doubt that The Australian will successfully defend itself from this prosecution. You may think that there is no problem then but you would be wrong. The HRC also knows that the prosecution will go the way of the publisher. In fact, I am quite sure that the higher-ups in the HRC don’t want to win it. The process is the punishment. The HRC seeks not to punish The Australian but to actively discourage other cartoonists around the country from putting pen to paper. Picture in the future a cartoonist who is about to draw a punishingly effective satire but balks as a nagging doubt warns him in the back of his mind that he might be prosecuted if he goes through with his piece. He still draws the piece but he modifies it so as to not get into trouble. The HRC has won. It has curtailed freedom of speech and expression by creating uncertainty as to the outcome. Fighting this present prosecution merely plays into the hands of the HRC. The solution is to not fight the prosecution at all but to ignore it and ignore any judgements and punishments that are given out. As well as this the newspaper needs to double down and commence publishing even more cartoons that the HRC might find offensive, (notice that it is the HRC finding things offensive, not the general population). Likewise the three students in Queensland who are presently embroiled in court proceedings with the HRC over the ridiculous demands of a university faculty extortionist, need to collectively withdraw their defense and refuse to accept any decision by the HRC nor any threats of fines or other punishments. In short, the HRC is an abomination that should not exist in a country that supposedly enjoys the great privilege of freedom of speech. By defending themselves before it those being prosecuted are unwittingly giving this corrupt institution credibility. The more people who defend themselves the more credibility it enjoys and the more its power will grow. Like an amoeba spreading across a petri dish, the HRC feeds on attention as can only be evidenced by it actively soliciting for work in the first place. Those people presently employed in the HRC feel some need to justify their jobs. They can’t be sitting there with nothing to do, twiddling their thumbs. They need to get out there and find some offensive hate happening around the country! The end result we should be seeking is two-fold. A repeal of the 18c law and the shutting down of the HRC once and for all. It’s up to the politicians to do both but we can affect the process. Ignoring the HRC’s court proceedings and abusive punishments is the best card we can play. How to drink Italian style. Podcast #24 – The Leadership episode – part one. If they can fine you you can’t ignore them. The government will do their dirty work for them. It turns out that they can’t fine you. Check out this post from Marcus. The prosecution is going ahead and the publisher of the cartoon, The Australian newspaper, is preparing to defend itself and its staff. The process is the punishment. As a million others have pointed out, Mark Steyn among them, whereas the Australian might win a court case brought against it at taxpayers’ expense, a hundred cartoonists without their resources will have been silenced. Job done. Erm, perhaps I should read the whole post before commenting: you made that exact same point. But you’re right:it will have to come down to enough ordinary people refusing to pay the fines and going to jail that it becomes politically unacceptable. And from what I’ve seen of modern-day folk – and I’m only 39 – they’ll fellate a middle-manager in the office in order to get a good appraisal. So I’m not sure we can count on them. And from what I’ve seen of modern-day folk – and I’m only 39 – they’ll fellate a middle-manager in the office in order to get a good appraisal. So true, gawd so true.